Two miles east of North Berwick is a rocky headland surrounded by cliffs offering stunning views north to the sea-bird colony on Bass Rock. Anywhere else, Bass Rock would dominate the attention, but here it takes second place to the remarkable curtain wall of Tantallon Castle, built on a spectacular site that by some accounts was the origin of the legend of King Arthur's Camelot. 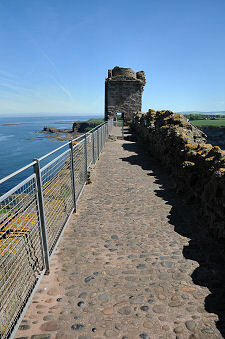 The castle is accessed from for A198 some two and a half miles east of North Berwick. There is a large car park just off the main road, and from here it is a pleasant quarter of a mile walk to the visitor centre: where there is also a rather smaller car park. From the visitor centre you stroll past huge grassy banks that form the castle's outer ditch and the defences of the outer ward. These bring you to traverse wall with a gun tower and a crossing over the outer ditch that leads to the castle's outer gate. Beyond this is the outer ward. 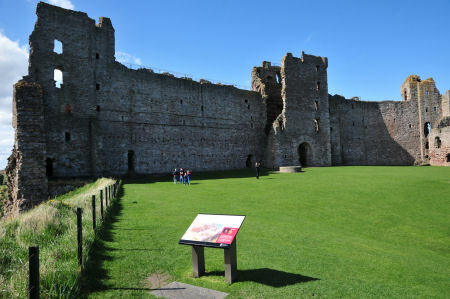 The outer ward now comprises a large grassy area that stretches across the neck of the promontory on which the castle stands. Today this is empty except for the dovecot, built in the 1600s, but during the castle's active life it would have been home to all the service buildings and accommodation necessary to allow the castle to function, including the bakery, the brewhouse and the stables. 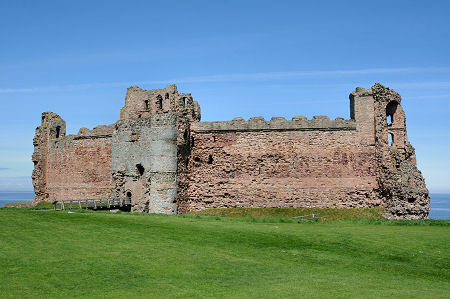 For the modern visitor the outer ward provides the best viewpoint of the main defensive wall of the castle itself. 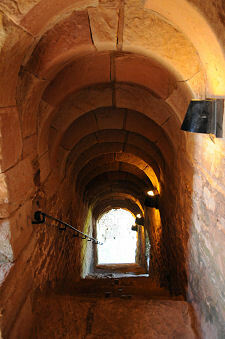 It is also the best place from which to gain an impression of how powerful the castle must have been in its heyday. The mid tower is the tallest part of the surviving structure, and as you pass through it, you begin to get a sense of the castle's true height for the first time. Beyond the mid tower you enter the close. Today this is bounded on the west and south west by the remains of the magnificent curving curtain wall, and on the north west by the remains of the hall block. On the far side of the close are the defences of the sea gate, designed to allow the castle to be supplied from the sea in times of trouble. Otherwise the close now forms an open grassy space surrounded on three sides by the cliffs falling sheer to the sea. It was not always so open. 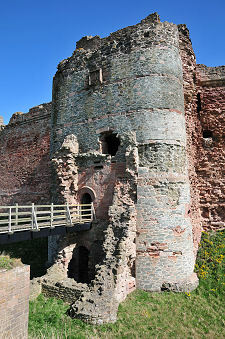 During the castle's active life ranges of buildings were also erected against the curtain wall, providing more accommodation. 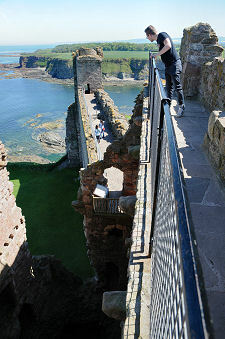 However you look at it, Tantallon Castle is really all about its massive 12ft thick curtain wall. We've already discussed the mid tower. In addition, at the north-west end of the wall was the large circular Douglas Tower, offering 6 storeys of accommodation for the Douglas family who held sway here through most of the castle's life. Very little of it was left standing by Cromwell's artillery. At the south-east end of the curtain wall was the East Tower, originally five storeys high but again largely destroyed in 1651. It is well worth taking the time to explore the stairs, passages and rooms that turn the curtain wall into something of a warren. And the highlight of the visit, literally, has to be the chance to check whether your vertigo has diminished at all (it won't have done, not here) as you wander the wall walk at the top of the curtain wall and climb still higher to the very top of the mid tower. While you are in the mid tower, keep a lookout for a spiral staircase that descends some distance into the tower within its north west wall. Beside the staircase near the top of the inward facing wall are two windows protected by grilles. On at least two occasions photographs have been taken which appear to show an unexplained figure looking out of the lower of these two windows. 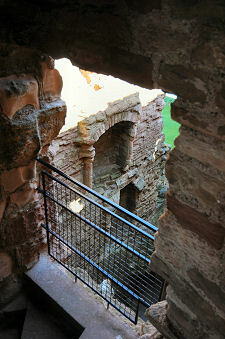 "The Ghost of Tantallon Castle" has never put in an appearance for our cameras, but the staircase here does have an uncomfortable feel to it. Or perhaps that's just our imagination... The ghost images can be found online, so you can see what you think for yourself. 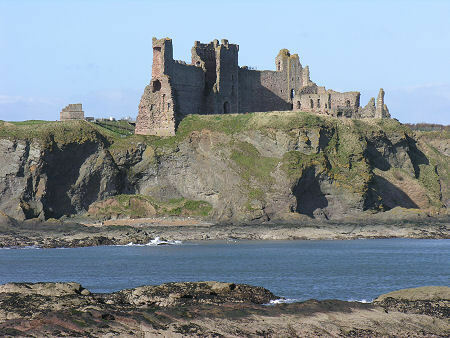 If you ignore the possible Arthurian connection, Tantallon's origins date back to the ennoblement of William, the First Earl of Douglas in 1358. 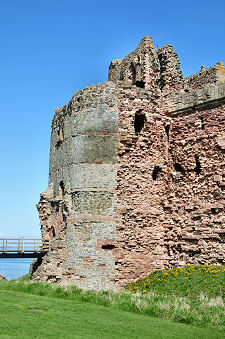 A later split within the family of the Douglas Earls of Angus left Tantallon under the control of the "Red Douglases", sporadically in conflict with the "Black Douglas" side of the family. And when their ambition grew too rampant or their relations with England too close, they also found themselves repeatedly in conflict with the Scottish Crown. In October 1491 Tantallon castle was besieged by James IV in reprisal for an agreement by the Fifth Earl of Angus to betray him to Henry VII of England. Despite the best efforts of the King's artillery train and the warship The Flower, little damage was done to the castle, and relations were repaired sufficiently by Christmas that year for the King and the Earl to exchange seasonal gifts. In 1528 the castle was besieged again, this time by James V, seeking revenge on its owner, his hated stepfather, Archibald Douglas, 6th Earl of Angus. Once more, however, the royal forces were outmatched by the castle's defences, which withstood an artillery barrage that lasted 20 days, again apparently with little damage. The following year James V took possession the castle following the exile of the 6th Earl of Angus, and set to work on improving its defences still further. 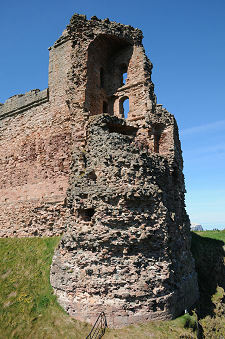 The 6th Earl of Angus regained the castle on his return from exile in 1543, and again sought to betray Scotland to England, allowing Tantallon to be used as a base and a treasury by Henry VIII's ambassador, Sir Ralph Sadler during, the "Rough Wooing" of Mary Queen of Scots (see our Historical Timeline). A sense of the sheer power of the castle at the time can be gained from a comment made by Sir Ralph in a letter to Henry VIII: "Temptallon is of such strength as I nede not feare the malice of myne enymeys..." He also commented, however, that the castle was poorly furnished and there were only limited stocks of food and coal. The Scottish crown again took control of Tantallon Castle in 1557, and it was visited by Mary, Queen of Scots in November 1566. Records from the time suggest that the physical defences were well maintained, and that the castle's artillery garrison was very strong. Tantallon Castle fared less well a century later when faced with the might of Cromwell's modern and much more capable artillery. 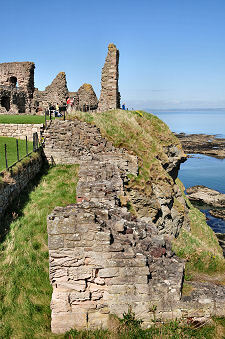 His forces were busily conquering Scotland during 1650 when Tantallon Castle was used as a base by a small group of moss-troopers. Their attacks on Cromwell's lines of communication across south east Scotland were said to have done more damage to the invaders that the rest of the Scottish army put together. Retaliation followed in 1651 when a force of up to 3,000 men, plus much of Cromwell's artillery in Scotland, confronted a garrison of fewer than 100 holding the castle. 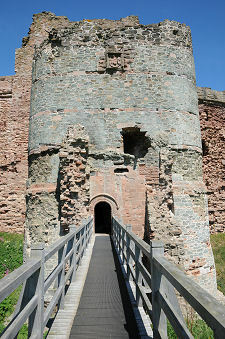 Over the course of 12 days, a great deal of damage was done, and a breach was opened in the defences that allowed the attackers into the castle. After a last stand in the central tower, the surviving defenders surrendered. 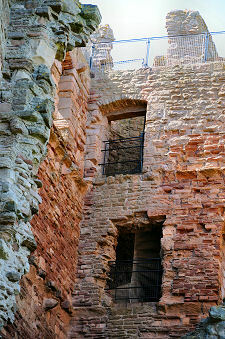 Tantallon was left in pretty much the condition you find it in today, and was then effectively abandoned. Work began to preserve the remains of Tantallon Castle in the late 1800s, and it passed into the care of the State in 1924. It is now looked after by Historic Environment Scotland.